The Tour de France is well underway, and this great cycling event wouldn't be complete without some colourful characters to cheer on the riders. It's commonplace to see spectators such as El Diablo running on the roadside alongside their heroes, even if it is potentially quite dangerous and frowned upon by the event organisers. This year it was the turn of a trio of intrepid bare-footed Nintendo cosplayers, who all appear to have taken invincibility stars to allow them to keep up with Team Sky's yellow jersey wearing Chris Froome... if only for a short time. Apologies for the poor quality video footage, but we're sure you'll agree this is quite an entertaining spectacle when accompanied with powered-up Mario theme music. Ha, I saw this last night... although, I didn't see Wario. I guess Waluigi dislikes bikes? 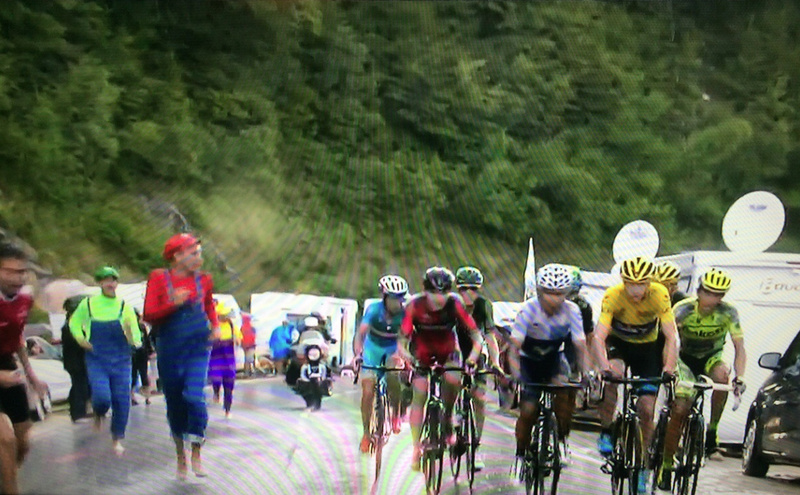 Now we just need this to inspire a crossover game... MARIO & MEGA MAN AT THE TOUR DE FRANCE....what? Sonic is busy with the Olympics (and fixing his franchise). @DarthNocturnal Waluigi's more of a pro-bending fan. He is a waterbender, after all. If only there was a fire flower about, then Mario could have easily defeated the competition. Ha, I noticed this, people really love the Tour de France. It's hilarious how many Nascar idiots there are that make fun of this race. Yet all they do is make left turns. Again. And again. Ha that's funny, they should have went with Sonic "Gotta go fast!" Wario needs to step it up. Strange, Waluigi's always bundled with the sports games! Very nice, i watch it every day, love the tour.